Besides Samsung Galaxy S7, the iPhone 7 could be considered one of the best phones of this year. This incredible device is able to deliver amazing performance, and it has features like water resistance, more storage capacity than its predecessors and a good battery life. Without a doubt, the iPhone 7 is a huge upgrade compared with other iPhones that Apple has released throughout the years. Moreover, with this phone, Apple has also made one of the boldest decisions ever. As everyone knows, Apple has removed the headphone jack from its device, which is considered to be a piece that people could not live without. Now, people have started to talk about what other moves the fruity-named company will do. During the years, Apple stuck to a pretty regular schedule, making major design changes to numbered models and leaving limited changes and other hardware modifications to “S phones,” for example iPhone SE or iPhone 5S. 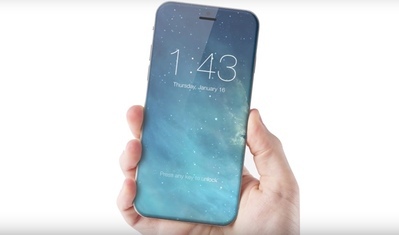 However, except for the missing headphone jack, this year’s model is similar to an iPhone 6 and 6S. So, we are curious to find out what Apple will do with the new iPhone 8. As we already mentioned, there are some rumors wandering around the Web, claiming some interesting new changes. So, for starters let’s talk about the home button. It seems that the company is planning to make some big changes to its signature home button. If the previous iPhone 7 came with a new, solid-state button that users didn’t have to click down, it seems that there are rumors that Apple is planning to ditch the button. Removing this button, the company will slim down the top and bottom bezels as well as add a larger screen. Another interesting thing that everyone is talking about is wireless charging. It seems that wireless AirPod headphones are already available on the iPhone 7, so why doesn’t Apple add a wireless charging feature? Samsung does it, why not Apple too? To be added that the Apple Watch already uses a form of wireless charging. During this year, The Verge reported that the company has been hiring wireless-charging experts.